Do buy the meatiest bacon you can find. This recipe wants a little bacon fat, but it should not overwhelm the olive oil. If you are a garlic light person, you may reduce the garlic, but please do not go less than 10 cloves or you will be better off with a different recipe instead. If there are guests at the table that do not like spicy foods, serve the chopped Calabrian peppers in a bowl and heat lovers can use them as a topping. Prep all the ingredients. Carbonara comes together very quickly and you do not want to find that something is missing during the mixing. Slice the bacon and chop the garlic and place them in separate bowls. Combine the eggs, cheese, parsley, oregano, and black pepper in a small bowl and place in the fridge. In a large skillet set over medium heat, add the olive oil. When the oil shimmers, add the bacon pieces Fry until the bacon is pretty well browned. While the bacon fries, bring water to a boil for the spaghetti. Add the garlic to the pan and stir constantly until the garlic aroma changes from raw to cooked and the pieces are only just taking on a slight tan color. Do NOT let the garlic turn dark brown or burnt. That’s why you are mindfully stirring and not heading off to answer the phone. Remove the bacon and garlic from heat if the pasta is not yet done. The garlic will be busy infusing the oil and the bacon with gorgeous flavor so the time spent sitting is all good. About halfway through boiling the pasta, reserve one ladle of pasta water. You may not need this, but then you might have added just a touch too much cheese. Drain the cooked to al dente spaghetti and gently toss with the garlic infused bacon oil. Wisk the egg mixture one more time and quickly add this to the spaghetti. Stir well. If you were over cheesy, add the pasta water just a tablespoon or two at a time. This dish should not be saucy, but neither should it be too dry to twirl. Stir in the Calabrian peppers now or set them out on the table to be used as a topping. A little grated Parmesan may be appreciated by a few guests. Enjoy with a lovely mixed green salad. 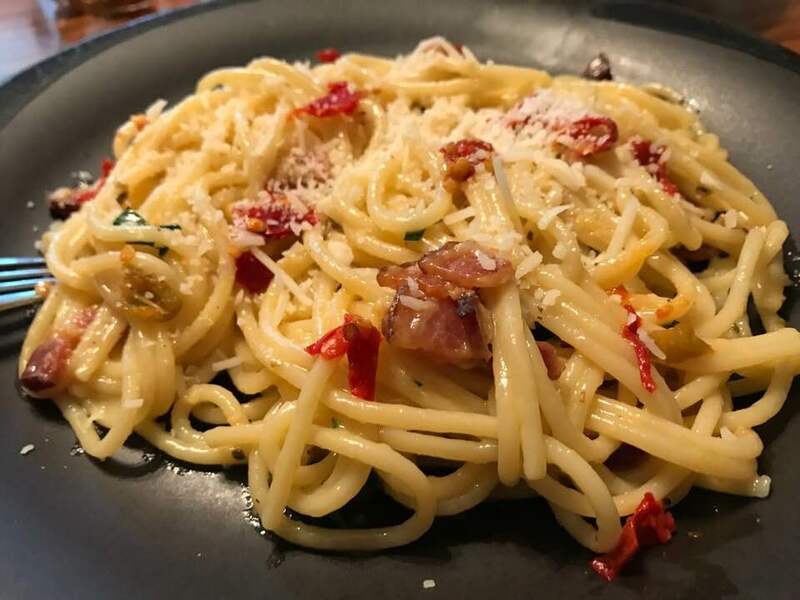 This entry was posted in Italian-American, Main Dish and tagged Calabrian hot peppers, carbonara. Bookmark the permalink. Looking to kick your carbonara up a notch? This brilliant addition is like crushed red pepper on steroids. Plate some pasta, twirl in a few chopped peppers straight out of the jar, and prepare to be amazed. The super sweet pepper bursts in your mouth and the slightly hot chili oil coats the rest of the spaghetti. Bam! Emeril would be proud.